Huntly Castle has seen more than its share of Scottish History, and has the scars to show for it. Over a period of 600 years this site saw four different castles in three slightly different locations under two different names. And between them these castles were attacked or besieged at least eight times. Just north of where the town of Huntly stands today lies the confluence of the River Deveron and the River Bogie. Command this spot and you command the most important route from Moray south to Strathdon and to Deeside beyond. In about 1180, Duncan, Earl of Fife, built the first castle here. This comprised a wooden defence around a motte, a steep-sided artificial mound, supported by a larger and lower rectangular defensive bailey. The motte can still be seen today as a 24m diameter hill, immediately to the west of the site of the standing remains of the castle. The bailey was reused for the site of the later castles. By early 1306, John of Strathbogie, by now both Earl of Fife and Earl of Atholl, was executed by Edward I for supporting Robert the Bruce (see our Historical Timeline). The castle passed to his son, David of Strathbogie. After years of family support for Robert the Bruce, which included his using the castle as a base in 1307, David of Strathbogie chose to shift his support to the English early in 1314. This was a bad move, coming as it did just before Robert the Bruce's final victory at the Battle of Bannockburn. In response to what he would have seen as treachery, Robert the Bruce granted the castle and the lands of Strathbogie to Sir Adam Gordon of Huntly, in Berwickshire, who had shown him more consistent loyalty. This brought the Gordons to Moray, and with them the name of Huntly that was later to replace Strathbogie as the name of the place in which they settled. In about 1410, Sir Alexander Seton, later Lord Gordon, cleared away the 230 year old wooden castle and replaced it with a stone tower house built at the north end of the bailey. Only the thick-walled foundations of the tower house now remain, visible on the north side of the castle courtyard. The tower house would have been accompanied by a defensive wall around the bailey area, and ranges of other supporting buildings. These remain only as foundations today. To modern eyes it seems a little odd to locate your castle where is is overlooked by the nearby motte, but this seems to have been an advantage all subsequent residents of the castle were happy to afford to anyone wanting to attack them. This castle was burned by the Earl of Moray in 1452, a member of the Black Douglas family and an opponent of King James II. In retaliation the Earl of Huntly (as the head of the Gordon family had become) destroyed the Black Douglas family in Moray. The damaged tower house at Strathbogie was replaced in 1460 by a much grander building on the south side of the site, where all later development was to take place. Today only the cellars under the later palace remain of this 1460 building. In 1506, Alexander, the third Earl of Huntly, was granted a charter changing the name of the castle and surrounding area from Strathbogie to Huntly, in effect fitting the geography to his title. 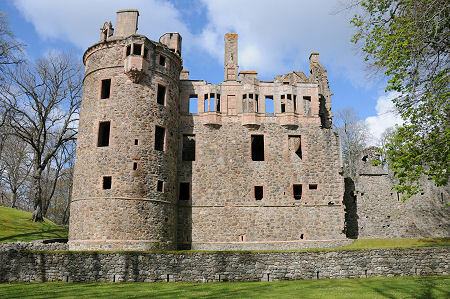 The castle has since been known as Huntly Castle, and the town to its south also later became known as Huntly. By 1550 George, the 4th Earl of Huntly, was also Lord Chancellor of Scotland and one of the wealthiest men in the kingdom. He rebuilt the castle above the basement level into a grand palace, finishing the work just in time for a visit by Mary de Guise, widow of James V and mother of Mary Queen of Scots. George's strong Catholicism and political independence were later to lead to his falling out with Mary Queen of Scots. On 28 October 1562 she defeated him at the Battle of Corrichie, near Aberdeen. 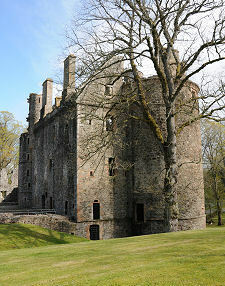 George was killed in the battle, while Huntly Castle was looted and George's younger son was executed. 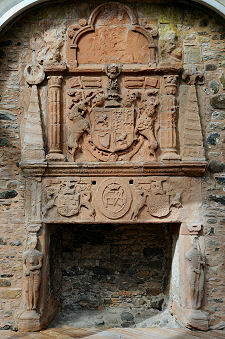 Repairs were still underway when another George, the 6th Earl of Huntly, joined a plot against James VI in 1594. The King's response was to attack the castle, damaging it again and blowing up the remains of the old tower house on the north side of the enclosure. By 1599 George had made his peace with James VI and been promoted to Marquis of Huntly. His response was a further round of building work at Huntly Castle, designed to make the 1550 palace even grander and more decorative. The remodelling around 1600 included the remarkable fireplaces on view in the palace, one of which is dated 1606, and the decorative oriel windows and inscription on the exterior of the upper floor of the palace. The inscription reads: George Gordon First Marquis of Huntlie 16 above Henriette Stewart Marquesse of Huntlie 02. The "16" and "02" together date the completion of this part of the work. Also dating to this remodelling is the incredible carved frontispiece stretching vertically above the main entrance to the palace on the courtyard side. This is unique in Britain. The architectural triumph of the palace that resulted was not to be enjoyed for long. The 2nd Marquis of Huntly backed the King in the Civil War and paid for it with his life. In 1640 Huntly Castle was occupied by the Covenanting Army. In 1644 it was held for the King by the Duke of Montrose. And in 1647 it was defended by Lord Charles Gordon against General Leslie's Covenanters, but starved into submission. The defenders were all executed. In 1650, King Charles II stayed at the castle en route to his coronation as King of Scotland. Huntly Castle last played an active role in Scottish History in 1746, when it was held by Government Troops against the Jacobites. It later became a handy quarry for those building the town of Huntly before its value as an attractive ruin began to be appreciated in the late 1800s. 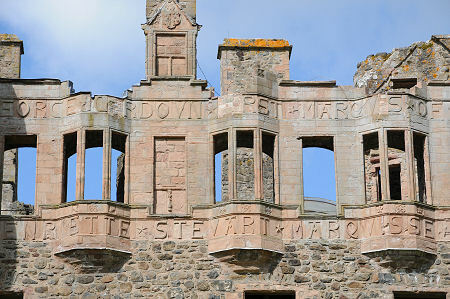 It was passed into State care in 1923, and is now looked after by Historic Environment Scotland. From a visitor's point of view, there's a lot to see at Huntly Castle. The long history of development makes exploration of the physical remains a fascinating experience. The castle today is dominated by the palace, in effect the south range, which still stands to full wall height. There are also partial remains of the east range on view, together with a brewhouse and bakehouse in the courtyard. Other areas of the castle and its predecessors survive as wall lines on the ground. Just to the east of the castle are the visible remains of a cobbled medieval road. There are three things you should really not miss on your visit, and all three involve the exquisite carved stonework. The first is the inscription on the front of the palace referred to above. This could hardly be called subtle: but then if you've got it, you might as well flaunt it. The second is the magnificent frontispiece also described above. The aim was to impress visitors, and it was originally highly coloured. Over four centuries on, it still impresses visitors, even without the colour. The third "must see" on your visit are the carved fireplace on the second floor of the palace. 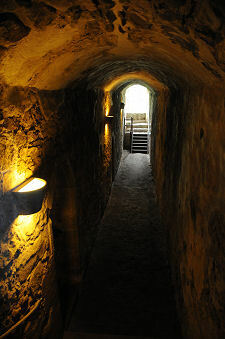 Add in stairs to climb, views to enjoy, and cellars to explore, and there really is something for everyone.